The author was born in Lucknow (Capital of Uttar Pradesh). He has completed his education up to B.Sc. from Lucknow after that he had graduated in Ayurvedic B.A.M.S from state Ayurvedic college, gurukul kangri Hardwar (Holi city of Ganga). After completing B.A.M.S he got selection MD course in both NIA & BHU at same time & completed MD (Bal Raga) from BHU. He had also taken diploma & certificate course in Yoga (BHU) & certificate course in psychiatry (Agra). Then he had given academe & clinical services to dept. of Stree Prasuti & Bal Roga, IMS, BHU as Service Senior Resident and now he is providing services as lecturer/consultant (Bal Roga) in S.R.M state Ayurvedic medical college, Bareilly (U.P) since last five years. He had presented various oral papers and participated in different seminars & symposia. He had also published over twenty publications in different magazine and journals including two other books published shortly. Life is born after passing through the extremes of pain, no pain can be parralled with the labour pain which a mother feels to give birth to a child but the mother can not tolerate a simple hunger pain of her child and she manages it within no times. So the management of pain is the utmost important in the life. Pain is a classical feature during onset of various diseases which ultimately sick the child. During newborn & infancy period it is very crucial to diagnose the pain; here main emphasis is given on the features of pain in various diseases, which provides a valuable approach during making diagnosis and management of the disease. This book provides clearly defined practical and proven approach to medical problems encountered during neonatal, infancy as well as in older children during day to day practice. It also deals the characteristic features described in the ancient books of Ayurvedic pediatrics with clinical correlation through modern medicine. 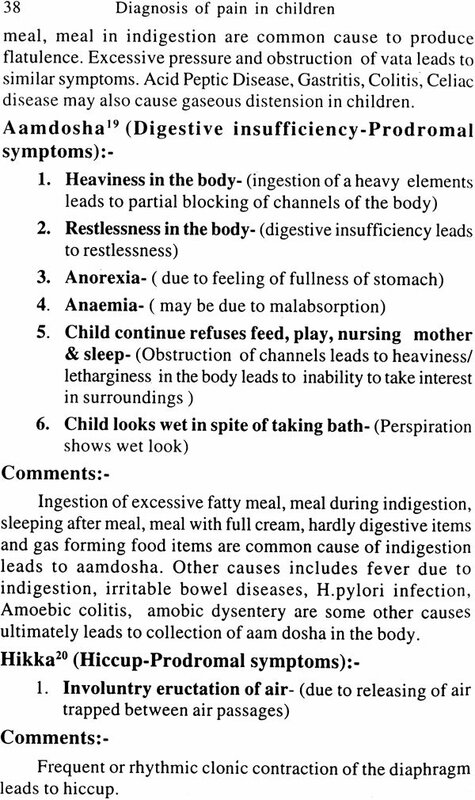 Emphasis is given to the sign & symptoms during onset of the diseases in the children, a prompt and adequate management of the need of the day. This book will be extremely useful to the undergraduate students, general practitioners and residents working in the Bal Roga departments and also to the consultants. Dealing with younger children is very crucial for the physicians. This is because of extrauterine adaptations, anatomical, physiological and biochemical immaturity. The prompt and adequate management of the newborn and pediatric diagnosis provides knowledge, skills and philosophy to handle the children. The book has been written to provide a simplified clinical approach to children’s with various medical disorders. The focus is entirely on physical symptoms and signs. Main aim of this book is providing a concise, simple matter on diagnosis of pain for the loving children. The book is addressed primarily to all medical students, pediatricians, General physicians to find brief, simple matter to diagnose the pain in younger children’s. The subject especially concerned to the younger child problems. In English translation some words given as such as in texts inspite many of them translated by English dictionary. Here we effort to write the younger child problems and interpretated in simplified form. In the subject collection few words are equivocal and many of them interpretated in English with the help of dictionary and ideas developing in the mind. The subjective matter chiefly sorted out from ancient texts as kashyapa samhita and some modern books of pediatrics & neonatology.